Shoreline Area News: Rob Oxford: When do you take a threat seriously... Always! Rob Oxford: When do you take a threat seriously... Always! I'd like to begin this article by thanking Shoreline Law Enforcement and the Administrators at Shorecrest High School for working swiftly yesterday to insure the safety of all our students from what was perceived to be a viable threat. Let me state clearly that there is no longer any threat, I repeat there is no longer any threat of violence at Shorecrest High School. Yesterday at 6:45pm, my youngest son returned from basketball practice and alerted me to a disturbing post that originally appeared on an app called "Sarahah". The developers of this particular application state that its purpose is to enable its users to give and receive "honest feedback from your coworkers and friends." anonymously. I have much to say about this type of application, but my feelings will have to be shared on another day. 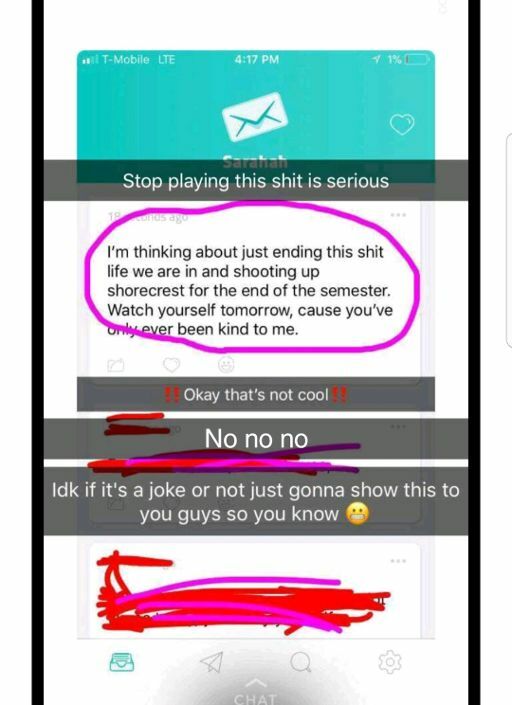 A message of violence towards students at Shorecrest was posted on the application of which someone quickly took a screenshot (the process in which a photo can be taken of what is currently being displayed on your phone or computer's screen). 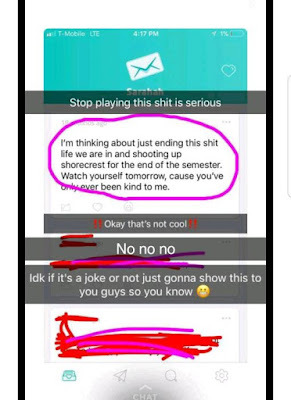 The "picture" was then shared on the popular "Snapchat" app with many students at Shorecrest. After initially having a difficult time communicating the seriousness of such a threat to both my sons, I was able to convince them that informing the proper authorities was not only the right thing to do, but our obligation. I stated that yes, it could be a practical joke but unfortunately in today's society, things of this magnitude must be taken seriously. Asking them how they would feel if they failed to report this and someone they knew was injured because of it, seemed to be the convincing factor. I then notified a friend of mine who works with the district. He thanked me for the information and suggested I thank my children for coming forth, which I had already done and stated he needed to contact the proper authorities immediately. Within minutes an email was sent from Principal Lisa Gonzalez explaining the situation and that law enforcement was investigating. It was later revealed that the police had been working on the perceived threat since the end of the school day and by 8:30pm the perpetrator had been apprehended. My friend Lloyd mentioned in a text thread that had been shared among concerned parents, that he "...hoped this person gets the help they need". I think we can all agree that for someone to initiate such a horrible prank only days after the school shooting in Kentucky, "help" is certainly something that should be provided. I am very proud of my sons for having enough faith in me, respect, confidence and concern for others to feel comfortable sharing this information. Now might be the perfect time to sit down with your own kids and ask them if they were aware of the threat. If they were and failed to tell you, you might just want to ask them... why? Thank you so much for your wise parenting. This message must be impressed on all our students and faculty. It is so important. No one wants to believe this type of threat is real, but we no longer have a choice. Thank YOU for taking the time to comment. I am pleased to say I was not the only parent who contacted the authorities and mine were not the only children who shared this post with their parents. As a community, we WILL make our world a better place.